According to this well researched NY Times article, India is depleating its groundwater so fast that scarcity could threaten whole regions, drive people off the land and ultimately stunt the country’s ability to farm and feed its people. Indian surveyors have divided the country into 5,723 geographic blocks. More than 1,000 are considered either overexploited, meaning more water is drawn on average than is replenished by rain, or critical, meaning they are dangerously close to it. Twenty years ago, according to the Central Groundwater Board, only 250 blocks fell into those categories. With the population soaring past one billion and with a driving need to boost agricultural production, Indians are tapping their groundwater faster than nature can replenish it. The crisis has been exacerbated by good intentions gone awry and poor planning by state governments, which are responsible for regulating water. Indian law has virtually no restrictions on who can pump groundwater, how much and for what purpose. The spread of free or vastly discounted electricity as a political tool to capture the rural vote has not helped either. This has ecouraging farmers to pump groundwater without abandon. Consider, for instance, that in Punjab, India’s northern breadbasket state, 79 percent of groundwater blocks are classified as overexploited or critical; in neighboring Haryana, 59 percent; and in southern tropical Tamil Nadu, 46 percent. Ever wondered where the "World’s Worst Polluted Places" were? Founded in 1999, Blacksmith Institute’s vision is a clean planet for our children. In November of 2003, Blacksmith Institute launched the Polluted Places Initiative to address severely polluted sites throughout the world. This is their 2006 list. Dr. Yunus, is the founder and pioneer of the concept of microcredit, the extension of small loans to entrepreneurs too poor to qualify for traditional bank loans. 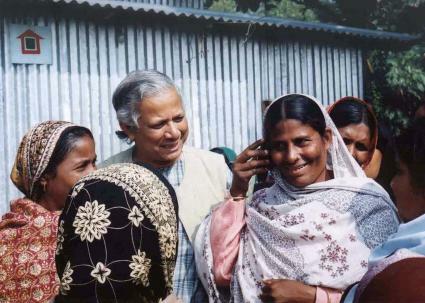 Yunus is also the founder of Grameen Bank. Grameen, which means “Bank of the villages”, was started to provide small loans (known as microcredit) to the impoverished without requiring collateral. The system is based on the idea that the poor have skills that are under-utilized. Since inception, total loans distributed amounts to Tk 290.03 billion (US$ 5.72 billion). Out of this, Tk 258.16 billion (US$ 5.07 billion) has been repaid.